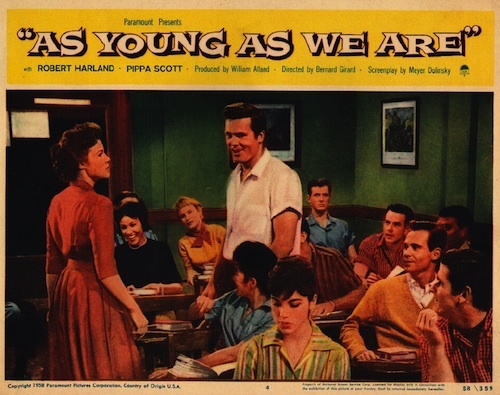 Kim Hutchins (Pippa Scott) and Joyce Goodwin (Majel Barrett) are fresh-out-of-teacher’s-college girls who get jobs at a tough desert school – the only place that will hire them, since they’re so young. The two move out to the desert together, with Kim leaving home for the very first time. On the way to their new town, they have car trouble and are saved by a local boy named Hank Moore. Since he seems to be a mechanic (with his own fancy truck and all), the women don’t realize that Hank could still be in high school. Kim decides to go on a few dates with him – only to find out that he’s a student in one of her classes. Scandal erupts in the town as word gets out about the relationship, and Hank isn’t willing to give Kim up. 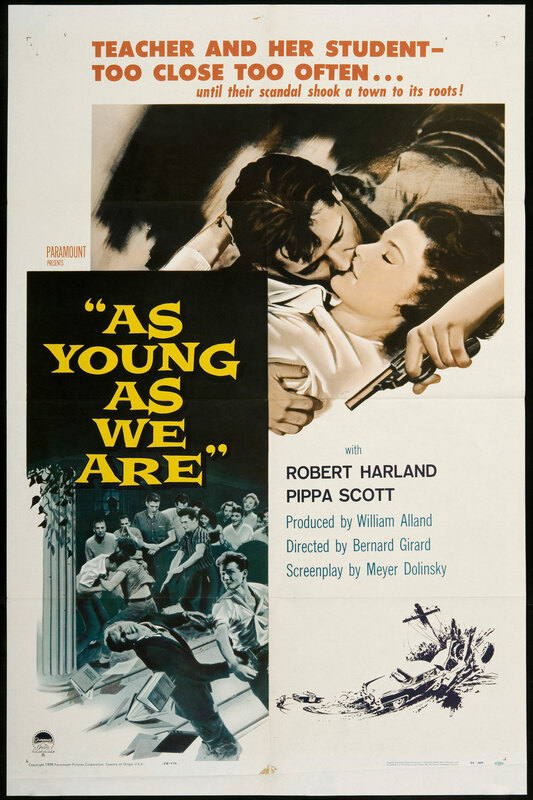 Bernard Girard (1969’s The Mad Room) directs As Young as We Are, written for the screen by Meyer Dolinsky (1978’s The Fifth Floor), who also co-wrote the story along with William Alland (1952’s Flesh and Fury). The story of As Young as We Are is nothing new. And older-looking student falls for an attractive teacher. The story has had a resurgence in recent years with “based on a true story” Lifetime movies and ABC Family’s Pretty Little Liars. It’s not surprising that this type of scandal was already a hot topic in the late 1950s. The school is supposed to be full of “tough kids,” which would have added some interest to the story, but instead the students seem more like your average suburbanites, some of whom simply despise school more than others. Pippa Scott gives the film’s best performance. She builds a pretty good level of sadness and worry around her character and provides some nice moments of drama, especially near the end of the film. Still, she didn’t have much to work with, and her performance wasn’t good enough to save the sometimes laughably bad script and weak supporting cast. Though this subject matter is usually given the straight drama treatment, the writers made the odd choice of trying to turn the story into a thriller near the end. While this is the most exciting and engrossing portion of the film, it doesn’t make a whole lot of sense.